KANSAS CITY, Mo. 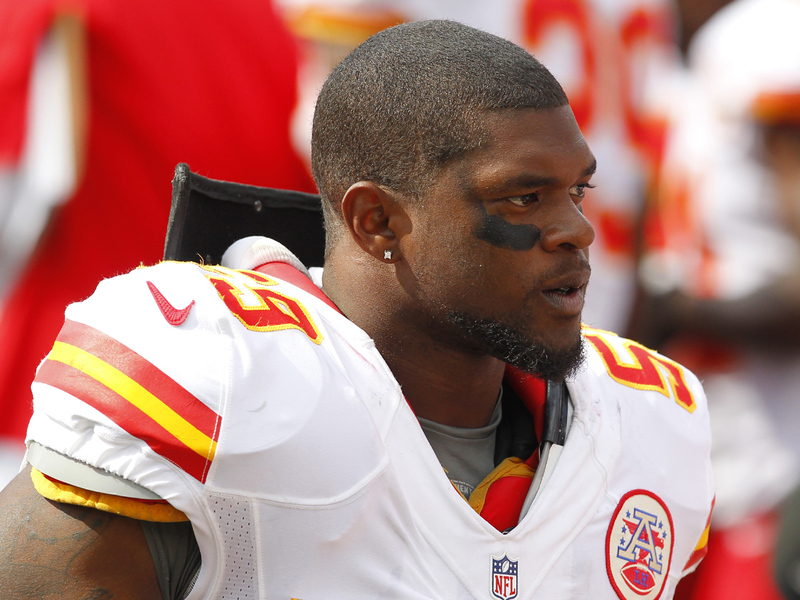 Kansas City Chiefs linebacker Jovan Belcher fatally shot his girlfriend Saturday, then drove to Arrowhead Stadium and committed suicide in front of his coach and general manager. Authorities did not release a possible motive for the murder-suicide, though police said that Belcher and his girlfriend, 22-year-old Kasandra M. Perkins, had been arguing recently. The two of them have a 3-month-old child. Belcher thanked general manager Scott Pioli and coach Romeo Crennel before shooting himself in the parking lot of the team's practice facility, police spokesman Darin Snapp said. Police had locked it down by mid-morning and reporters were confined to the street just outside the gates. The Chiefs were scheduled to play the Carolina Panthers on Sunday at Arrowhead Stadium. The Panthers were advised by the league to travel to Kansas City as planned, though no official announcement on the game itself had been made. Belcher was a 25-year-old native of West Babylon, N.Y., on Long Island, who played college ball at Maine. He signed with the Chiefs as an undrafted free agent, made the team and stayed with it for four years, moving into the starting lineup. He'd played in all 11 games this season. The NFL released a statement that also expressed sympathy and said, "we have connected the Chiefs with our national team of professional counselors to support both the team and the families of those affected. We will continue to provide assistance in any way that we can." "She treated Kasandra like a daughter," Snapp explained. Belcher's mother, who is from New York, had recently moved in with the couple, "probably to help out with the baby," Snapp said. "They said the player was actually thanking them for everything they'd done for him," he said. "They were just talking to him and he was thanking them and everything. That's when he walked away and shot himself." At Belcher's mother's home on Long Island, relatives declined to talk to reporters. A purple SUV in the home's driveway was flying a small Kansas City Chiefs flag. Perkin's Facebook page shows the couple smiling and holding the baby. Belcher is the latest among several players and NFL retirees to die from self-inflicted gunshot wounds in the past couple of years. The death of the beloved star Junior Seau, who shot himself in the chest in at his California home last May, sent shockwaves around the league. Seau's family, like those of other suicide victims, has donated brain tissue from the linebacker's body for research to determine if head injuries he sustained playing football might be linked to his death. Kansas City Mayor Sly James said that he spoke to Pioli after the shooting, and while he refused to discuss the GM's emotional state, the mayor said Pioli was "extremely concerned that fans of this team are not disappointed and not left in the cold." The season has been a massive disappointment for the Chiefs, who were expected to contend for the AFC West title. They're just 1-10 and mired in an eight-game losing streak marked by injuries, poor play and fan upheaval, with calls for Pioli and Crennel to be fired. The Twitter account for a fan group known as "Save Our Chiefs" recently surpassed 80,000 followers, about 17,000 more than the announced crowd at a recent game. Maine's head football coach, Jack Cosgrove, said Belcher was a "tremendous student-athlete." "His move to the NFL was in keeping with his dreams," says Cosgrove. "This is an indescribably horrible tragedy."